Dashain (Vijaya Dashami) is a traditional cultural festivity. Before Prithvi Narayan Shah (1868), the festival of Dashain and Tihar had been revered as a common culture of all castes. After Prithvi Narayan Shah created a modern Nepal, a new tradition was set by bringing Phulpati and Jamara to Kathmandu from the Gorakhkali Temple by a Magar priest. People from both the religion of Hindu and Buddha take Tika from senior family members in order of precedence after worshipping the main gate on the occasion of Vijaya Dashami. According to the Encyclopaedia of Religions and Ethics, signs of Hindu religion are even found today in Islamic countries like Iran. Stone scriptures of 486 BC found in Iran contain the words Hindu and Hindus. Even an ancient Parsi scripture ‘Shatir’ has lifted a word of Vedavyasa, ‘I am a true Hindu-born in a Hindu country’. Currently, fiends are ruling Nepal. The monsters are playing with the identity of Nepal under the guise of wolves and the Indian direction. Patriotic people are pondering how to save the nation and chase the monsters. The agendas of republic, secularism and federalism will disintegrate the nation. Nepal has been orphaned without the monarch. The Dashain celebrated in the absence of the monarch is like a nation without identity. It is a matter of grief. The identity of a nation fades away when its cultural belief is in a sequence. To avoid this Hindus, Buddhists and patriotic Nepali people scattered across the world must launch an initiation. We patriotic people of the nation pray to goddess Nava Durga Bhawani to be prosperous to the Nepalese People all around the world. Including all Political Parties have to work far to come on the track to save the national traditions and culture. A country’s existence and prestige can gradually be eroded by finishing off its faith and belief tradition and culture traditional faith and cultural beliefs. If anyone wants the assurance of integrity and lasting peace in this country, one must not be confused about the country’s centuries old customs and religion. Dashain (worshipping Goddess Bhagawati for Power) and Tihar (worshipping Goddess Lakshmi for wealth) is a knot of cultural interrelationship among the Nepali people. Nepalis residing outside the nation take the festival as the identity of Gorkhali Nepali people spread across the world regardless of their caste and they exchange greetings and celebrate the festival in perfect cultural harmony. In Darjeeling, Sikkim, Duarsh, Asaam and Deharadun, Dashai and Tihar is taken as a occasion of Gorkhas unity.Hindus in India, Burma,sri Lanka, Indinesia including other nation around the globe celebrate Dashai in their own ways. Dashai is common festival of poor and rich. 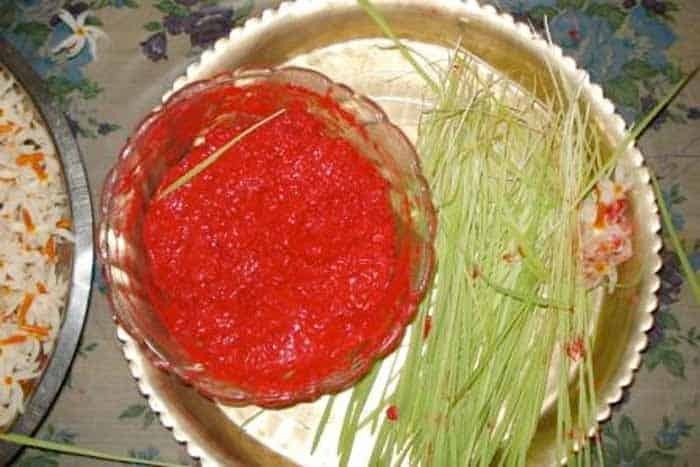 Tika, a mixture of cord, red vermilion and rice is placed on the temple of the body by seniors. the ritual starts from Bijaya Dashami and lasts till full moon day with much zeal and merriment. Tika is received from father,mother, father-in-law, mother-in-law,teachers and other revered senior members with blessings.Dashai is also important to Indian Hindus celebrate the occasion without receiving Tika. Nepalis influenced by Christian religion have been creating numerous illusions with an aim to urge people to boycott the great festival. But some Christians cilabarate Dadhai as a cultural value without Tika. There have been efforts to pollute the holly festival with the color of the political-party. The leaders of Democratic and communist party in Nepal are not following the norms and values of their respective parties. But they do everything what the South Block, Research and Analysis Wing (RAW) advises them. This is the regretful matter for our country. Some people belonging to indigenous groups are competing with each other to show there are better by boycotting Dashai. But indigenous people living abroad are lashing out at the concept. Prof.Gopinarayan Pradhan of Darjeeling said,’the attempt to reduce the extensive Nepali identity to class based identity is sad.’ Swami Prapnanacharya said-‘Estadev Mahadev, Parwati and Drawasam and Yumasan. Worshipping Nawadurga in Nawaratra is an ancient tradition. To pollute the ancient culture of receiving Tika on the day of Dashami or Bijayadashami at the right time is not wise. People observe Tika receiving ceremony as an opportunity to resume past broken relations with their relatives and friends. This is a joyous festivity. Those who have chosen to boycott the festival have made a mistake. This is their defeat. What can be achieved from losing the identity? Dashain is an immense opportunity for the relatives living abroad to come together. The poor people, victims of perennial shortages, gather to wear good clothes, eat good food and celebrate the festival with joy. In reality it is not a Dashain religion, it is a traditional cultural belief. It should be kept alive. I extend to everyone the greetings on the occasion of Vijaya Dashami 2065.